Ideally located in the vibrant Nana area of Sukhumvit Road, Adelphi Suites Bangkok is one of the best hotels in Bangkok and places you right at the nexus of Bangkok’s shopping, business, finance and entertainment districts. Only a short stroll down Sukhumvit Soi 8, Adelphi Suites Bangkok is approximately 100 meters from Nana BTS SkyTrain – your gateway to exploring all that Bangkok has to offer. Just a couple of stops away, you’ll find several large and internationally renowned shopping centers, Bangkok’s “Embassy Row”, a multitude of corporate office buildings and the Queen Sirikit National Convention Centre. 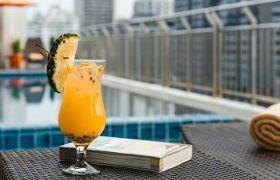 For those who don’t want to venture too far afield from the comfort of their serviced apartment in Sukhumvit, there are also numerous eateries, entertainment venues, bars and clubs located within easy walking distance of this Nana hotel. Both Suvarnabhumi and Don Muang International Airports are easily reached from Adelphi Sukhumvit Suites via either the Airport Rail Link or by taxi on the expressway network.